Today more and more people are looking to lead healthier, more balanced and energetic lives. In a world where we are constantly pressurized and in demand, never have enough time, and seem under constant stress, many of us struggle to enjoy good health. Maybe that’s why your interested in this free guide - The Secrets to an Energetic and Abundant Life? 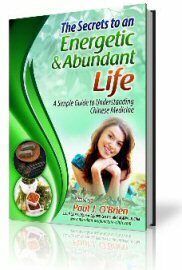 If you are like my other patients and the other people that have read this short book, then you are looking for way to enjoy a healthier energetic life, free from chronic illness, pain, or fatigue. Most of my patients and readers don’t want to have to choose between being on medication for the rest of their life, or suffering from nagging health problems they just have to put up with. And I’m willing to bet neither do you. You want to live life unlimited in its potential. You want to enjoy boundless energy. You want your body to be a symbol of the vitality and strength you feel. You want to return to the energy and vitality of youth. If you’re nodding your head and saying yes to any of these, then the chances are that you are sick and tired of being run down and denied the quality of life that you deserve due to various health problems. The good news is the information in my new guide could change your life. Finally I’d like to encourage you to be proactive about your health and treat it as a top priority for the rest of your life and enjoy the health and energy that comes with it. Having suffered from chronic health problems myself I know firsthand how frustrating and challenging it can be to struggle with chronic health issues. But the good news is there are simple solutions. There are answers. I’ve changed my life and enjoy amazing health and energy using the tools I am going to share with you in this book, as have the hundreds of patients I have treated in my private practice, and you’ll hear some of their stories later, for now though, I’d like you to think thank you for taking the time and interest in yourself to read this material. In my practice I’ve seen time and again over the years that health problems, big and small, are often warning signs from within ourselves that we need to change the way we currently do things. Learning to live a life of abundant energy and happiness has a lot to do with learning from your health concerns and the feedback your body is giving you, not just pushing them away or judging them as negative, or simply suppressing them with drugs without actually solving the problem. The holistic approach in my practice, and that you will learn about in this book, has been for my patients, where true healing begins. The information contained in these pages can be your blueprint for a new way of understanding your body and mind, and a roadmap to a new energetic and illness free life. You can download your free copy of my guide below.